New or old – there's a way to increase the efficiency of any refrigerator. Here's how to do it. Ways to Increase the Efficiency of Your Fridge. There's a good chance that the temperature in your fridge is set lower than it needs to be. A refrigerator temperature of 37°F and a freezer temperature of 0°F will keep your food from spoiling, without causing you to spend unnecessarily (that's usually the middle setting on the temperature knob). To test the temperature of your refrigerator, place a thermometer in a glass of water, and check it the next day (or after the fridge has been closed for at least eight hours). To test the temperature of your freezer, place a thermometer between two frozen foods; then, check it after eight hours. Note: It can take up to 24 hours for a temperature change to take effect. Want to save even more? 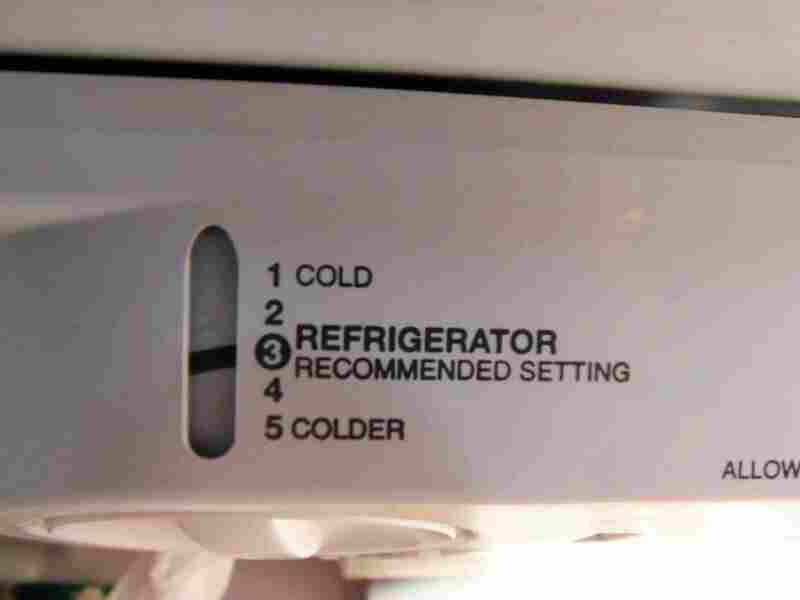 According to the Food and Drug Administration, refrigerator settings can safely be set as high as 40°F, while freezer settings can be set as high as 5°F. Did you know that an automatic ice maker increases a refrigerator's energy use by 14-20%? That's crazy! If yours has this feature, consider turning it off, and going back to ice cube trays. Fridges manufactured after 1993 often include a switch that lets you choose between an exterior moisture-reducing mode and an energy-saving mode. What's the difference? Set your fridge to the exterior moisture-reducing mode and a heater will kick on to keep condensation off the outside of the fridge; set your fridge to the energy-saving mode and it won't -- an energy-savings of 5-10%. Note: If you have a newer refrigerator, it may have automatic moisture control, which eliminates exterior condensation without the use of a heater. Placing cereal boxes and other junk on top of your refrigerator could block heat from escaping, and cause the compressor to work harder than it's supposed to – that's not good for your electric bill or the lifespan of your fridge. Close the door on a dollar bill or a piece of paper. If you're able to pull it out easily, your refrigerator's gasket needs to be adjusted or replaced to prevent cold air from escaping (and to prevent frost from building up inside the freezer). Vacuum the refrigerator coils several times a year to maintain the efficiency of the compressor. Make it a monthly task, if you share your home with furry pets. Avoid placing your refrigerator next to the oven, dishwasher or a heat vent. Also avoid placing it near a window. All of that extra heat will cause it to run more frequently, which will add to your utility bill, and wear out your fridge sooner. When you're able to find things quickly, you don't have to keep the door open for long. Try to create designated spots for all the foods you buy regularly, so everyone in your household will know where to find things. To cut down on the amount of time the freezer door is open, consider creating a freezer inventory list that you can stick on the door. As long as you keep it updated, you won't have to spend a bunch of time digging around in the freezer. Woman pulling unwrapped food from fridge. Placing open drinks and food containers in the fridge increases internal moisture levels, and makes the compressor work harder. Train your family to cover everything before it goes in, and you'll also prevent foods from contamination. It takes less work to maintain the temperature in a full refrigerator. Just make sure your fridge isn't so full that it prevents good air circulation (three-quarters full is a good rule of thumb). Place the back of your refrigerator at least two inches from the wall to allow heat to move away from the condenser coils. Trapped heat will cause your fridge to run more frequently.